In my first years as a pavement artist in Rome, I quickly learned to try and save enough for the winter before the weather turned too cold. As winter approached, I would retreat into my small studio in Piazza Chiara behind the drum of the Pantheon. Having never been fond of commercial chalks because of the dust and limited color palette, I always created my street paintings with pastels. Chalks are made from calcium carbonate, a common white rock composed mostly from the remains of minute sea organisms. This natural substance is ground into a fine powder and mixed with a binder to form white chalks. Tinting chalk powder with a minimum of pigment or dye makes colored chalks. Pastels are created from a claylike paste traditionally composed of pure pigment and binder. Most commercially available pastels also contain a percentage of chalk to make them smooth. I used these cold months to study and experiment with making pastels by hand. Just one of my large paintings could consume nearly a hundred pastels, and purchasing expensive high-quality ones took a large bite out of my profits. Although I was using the best-quality materials I could find, I was increasingly unhappy with the restricted color palette. I couldn’t achieve the dark, rich tones of master paintings, or find a white that would really cover the surface of the pavement. Furthermore, I needed materials that would stand up to the challenges of sun, wind, dirt, rain, grease, and irregular surfaces. Commercial pastels were designed for working on paper in a protected environment, so they really were not up to the job I needed them to do. I uncovered several antique recipes for pastels. Their authors had uses in mind other than street painting, but the recipes served as a starting point. These were personal formulas based on the experiences and intuitions of the artists. They called for mixing natural pigments with a range of comestible binders, such as sugar, milk, fig’s milk, beer, ale, and honey. Orwell reports that pavement artists bought their colors in the form of powder and worked them into cakes using condensed milk as the binder. The old recipes simply consisted of ingredient lists, without portions. Occasionally a spoonful or a cupful of an ingredient was mentioned, but without any reference as to the actual size of the spoon or cup. Once I perfected my recipe with the proportions for each pigment, I was able to make pastels that were exactly the colors and texture I wanted. I developed his my classical palette, which seeks to balance the hue, value, and saturation of the colors. Never having had the opportunity to work with a truly balanced set of colors before, I was excited at the prospect of increasing the efficiency and the subtlety of my work. Initially, I created fifteen hundred pastels in a period of two months. Other street painters became very interested in making pastels as well. I shared my recipe with them, and eventually we had group pastel-making sessions. 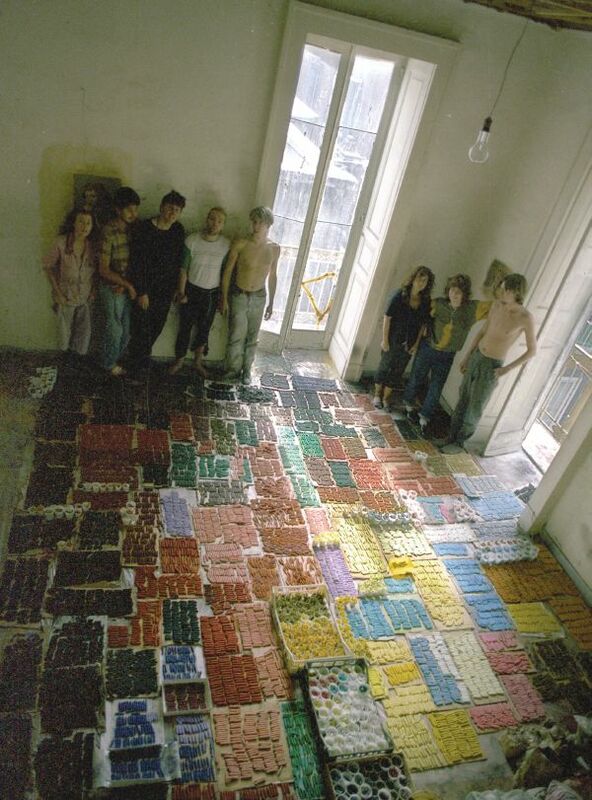 The largest one was in Naples, when seven street painting friends from six countries made twenty-one thousand pastels in a week. Needless to say, both the studio and the participants were a mess. It took us another week to clean everything. Pastel chalks are perhaps the most rewarding artists’ material to make. Pastel chalks are difficult to market because of the huge variety of hues and shades that must be stocked and because of their fragility. 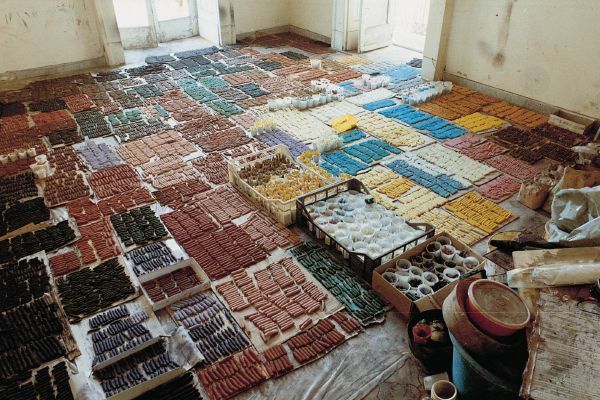 The cost of pastels reflects the inconvenience of manufacturing and marketing them rather than the base value of their ingredients. An artist who makes pastels is rewarded with a significant savings along with superior materials and the flexibility of a personalized palette. The recipe below is an original recipe of mine. Other pavement artists have published parts of this recipe without giving me credit. If you have come across a similar recipe, (using wax emulsion, for instance), and have published it on a blog or editable format, please credit me for the recipe. Some of the other versions have mistakes as well, so it would be best to use this recipe. Chalk is calcium carbonate, a soft, fine-grained white calcium carbonate. In essence, it is composed of ground up diatom skeletons. It can be made from slaked and dried lime, (sometimes called precipitated limestone). It can be purchased from large construction-supply sources. Talcum powder, hydrated magnesium silicate, is often an ingredient in French pastels. Silica, (silicon dioxide), is a similar but more refined filler than calcium carbonate, and has even less tincture strength. It is available in numerous particle sizes as well. Fillers are not necessary for pastels and are mostly used for reducing costs, although they can provide smoother blends for artists that like to work “impasto”, (using lots of material and pushing it around). Reds: Red pigments include Ferrous Oxide Reds– (Red Ochre, Mars Reds, Burnt Sienna, etc.). Synthetic red pigments include- Cadmium Red (light, medium, and dark), Chrome Red, and the organic pigments, Alizarin Crimson Quinacridone Red*. Oranges: Orange pigments include Ferrous Oxide Oranges– (Dark Yello Ochre, Mars Orange, etc.). Synthetic orange pigments include- Cadmium Orange (light, medium, and dark), and the organic pigment, Quinacridone Orange*. Yellows: Ferrous Oxide Yellow, (light, medium, and dark). Synthetic yellow pigments include Cadmium yellow (light, medium, and dark), and Chrome Yellow and the organic pigment, Quinacridone Yellow*. Blues and Greens- There are no “natural or ferrous oxide” blues except for Ultramarine, which is problematic for pastels and must be used in a mixture with other pigments. A good ferrous oxide green exists, which has different names depending on the source. Synthetic blues and greens include the organic Pthalo(cyanine) colors, which are all extremely useful. Cobalt Blue is useful as well, though expensive. Violets: Violet comes as Mars Violet– a Ferrous Oxide, and as a tint of Pthalocyanine. Cobalt Violet is extremely expensive and hard to use in pastel. Browns and earth tones are available as ferrous oxides, or earth pigments. Earth tones such as Burnt Sienna and Burnt Umber are chemically similar to oxides, but occur naturally. They are excavated, ground into a powder and literally burnt in a kiln. The “raw” versions of these pigments have not been fired. Raw Sienna and Raw Umber are problematic for pastels, because they tend to be cementatious. This makes the pastel stick too hard. *Quinacridones are not as good for pastels as cadmiums, but can be used in combination with other pigments. Alizarin Crimson is a bit difficult to use for pastels. It also varies in quality between manufacturers. Binders hold the pastel sticks together; they include gums, glues, waxes and oils. Gum Tragacanth is a natural gum obtained from the dried sap of Middle Eastern Legumes. Gum Arabic, also known as acacia gum, is a natural gum made of hardened sap taken from two species of the acacia tree. Of the two, Gum Tragacanth is by far the more suitable binder. Glues are less suitable, but wheat paste, wallpaper paste, (Methyl cellulose), and even white glue are sometimes used as binders. Binders for pastel must have very little strength or the pastel will become too hard and will not leave a mark on the drawing surface. Beeswax can be emulsified into a water solution using a solution of bar soap, such as Ivory Soap, and/or household ammonia. This imparts flexibility to the pastel stick, reduces the dustiness, and helps the color stick to the drawing surface. As the name implies, colored chalks are mostly chalk, or other inert pigments, with a little pigment added. Other inert pigments include marble dust, powdered quartz and silica, (essentially glass powder). Inert pigments have low tinting strength and so as little as 3% to 5% pigment may be sufficient to obtain many colors. Commercial “pastel chalks” or “dry pastels” generally contain 15% to 35% pigment, although there is no rule for this and manufacturing varies widely. When these pastels are sprayed with a fixative, the colors darken- this is called “sinking in.” Sinking in is caused by the fact that chalk and talc become transparent when varnished. 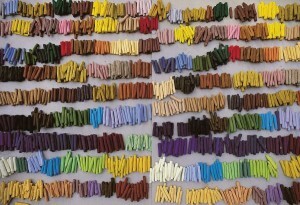 “Fixing” pastels is in any case not a good technique, but it is especially damaging when the pastels contain chalk or talc. Pastel is a permanent technique when used properly, but pastels must be displayed under glass. In this case they need no fixative. Fixatives harm pastels over time. My handmade pastel recipe uses no chalk or talc, only permanent artist’s pigments and natural binders. Although they are a dry medium, their intensity and opacity can give them the appearance of oil pastels. A very small amount of material is sufficient to create a rich, full coloration. They can be blended dry, or with water or turpentine. They can also be over-painted with oil or acrylic. For pavement art it is extremely useful to work thinly with a small amount of material. In this way, it is possible to walk over the painting during the early stages of the execution because most of the pigment is pushed into the pores of the surface. When it rains, some of the pigment is washed away, but there is a significant after-image left to facilitate reworking the drawing. Apart from hardness or softness, the major distinguishing feature a pastel is its dry or waxy quality. Some pastels are chalky and dusty, whereas others have a more waxy crayon-like consistency. Some pigments such as titanium dioxide produce a naturally waxy consistency pastel while others, such as burnt umber or ultramarine tend to make dry and chalky pastels. 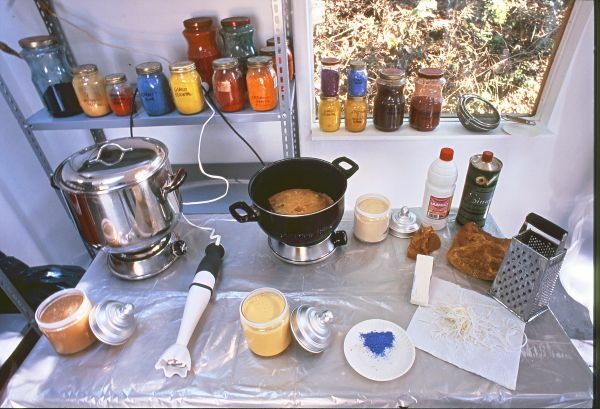 A wax/oil emulsion allows artists to balance different pigment properties in order to produce a consistent set of pastels that conforms to their artistic needs. Wax soap contains oils, fat and alkali in trace amounts, probably less than 2%. Artists concerned about the permanence of the artwork are advised to use pigments and painting grounds that are insensitive to these materials. (All pigments listed are insensitive except alizarin crimson and pthalocyanine blue). The recipe below is fairly complicated and the emulsification is not recommended for artists that have not assisted in a workshop. The recipe is also not for children. Please read the last section for advice on making pastels with children. Emulsification is the process of suspending a wax and/or oil into a water solution. Hand creams and some conditioners are examples of emulsions. The emulsification process involves pouring boiling ammonia into melted beeswax. The reaction takes place at a temperature above the boiling point. If the temperature exceeds 300 degrees Fahrenheit, the mixture can explode, which is very dangerous. If the materials are not hot enough, the emulsification will not be successful and the wax will separate from the water. 1 plastic tub of iced water to hold the pot of emulsion while cooling. It is best not to try to make too much emulsion in a single batch. Start with ¼ cup as a “part” in order to test the process. This will yield about a quart of emulsion. Do not exceed ½ cup as a “part” unless you are very experienced and have appropriate equipment. 1. Heat the beeswax in the electric skillet until liquid. Measure 3 parts of the liquid beeswax and combine with 1 part linseed oil. Remove excess beeswax from the skillet. Return the beeswax/oil solution to the electric skillet and heat to 325 degrees. 2. Finely grate the Ivory bar-soap. Pour the ammonia into a covered pot. Over medium high heat, bring the ammonia to a rapid boil, add the ivory soap if desired and stir with a French whisk until the soap is fully dissolved. This is best done outside, be very careful not to directly inhale the fumes. They are not toxic, but can cause choking, faintness and eye irritation if inhaled directly in sufficient quantity. 4. Pour the emulsion into the second metal pot and place the pot into the ice water bath stirring constantly. Stir until room temperature, or just slightly warm to the touch. The emulsion should be smooth and free of grains. Its consistency should be like heavy cream. At this point it can be thinned with water if necessary, although it will eventually be added to the glue mixture, so it is best to leave it alone unless it is very thick. After the selection of the pigments is the selection of the glue. The best quality glue for pastels is gum tragacanth. It can now be found on the Internet in powdered form. It is more expensive than other glues, which will be described later. 1. Buy the Gum Tragacanth in powdered form, not in ribbon form. The powder will not mix readily with water- it will clump up. Mix the powder first with alcohol- the kind sold in the supermarket or hardware store is fine. One part Gum powder to 5 parts alcohol by volume is fine. 2. Once the powder is dispersed in the alcohol, add the mixture to a container with 10 parts water. 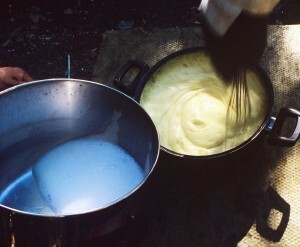 The water should be churning in a blender or mixer as the gum solution is added. The gum likewise needs to be stirred while in the alcohol solution or it will settle to the bottom of the container. 3. Stir the mixture occasionally, but do not let it froth. It is best to let the solution sit for 8-12 hours before using it. The resulting liquid should be thick and slimy, but easily pourable. The binding strength will need to be tested, so the initial result is not extremely important. 4. After the glue is prepared, three mixtures are made: full strength, half strength, and quarter strength. These can be in small amounts, perhaps a small plastic drinking cup half-full. 5. Follow the instructions given below to form the pastels from each of the glue mixtures and set the test pastels to dry on a paper labeled with the strength of each mixture. Mixing the three solutions with titanium dioxide pigment Titanium dioxide is probably the most consistent and easy to use of the pigments and is best for testing the glue strength. 6. Whichever glue strength produces the right hardness of white pastel is the proper solution. Most of the gum can now be mixed to this strength. Keep some of the stronger solution aside for difficult pigments. The adjusted solution can now be used to make test pastels with each pigment. These test pastels will indicate whether the solution needs to be stronger or weaker for a particular pigment. 7. Much of the glue can now be added to the emulsion. About two parts glue to one part emulsion is good to start with. 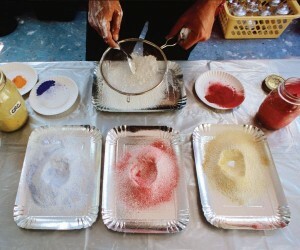 Different mixtures of pigment may require different proportions of glue to emulsion. The properties of pigments vary not only between colors, but also among manufacturers and once upon a time between batches. 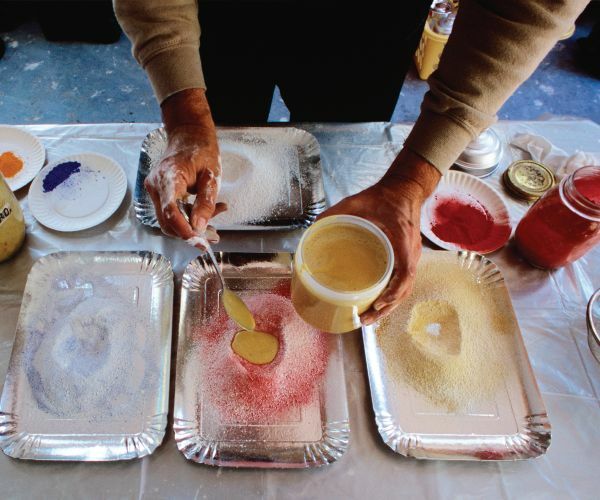 Different combinations of the emulsion and glue mixtures can make almost any pigment usable. The organic pigments that weigh less generally need more emulsion to make pastels that match the consistency of the heavier mineral colors such as titanium and cadmium. Some pigments have natural cementing properties that result in brick-hard pastels even when they are formed using only water. 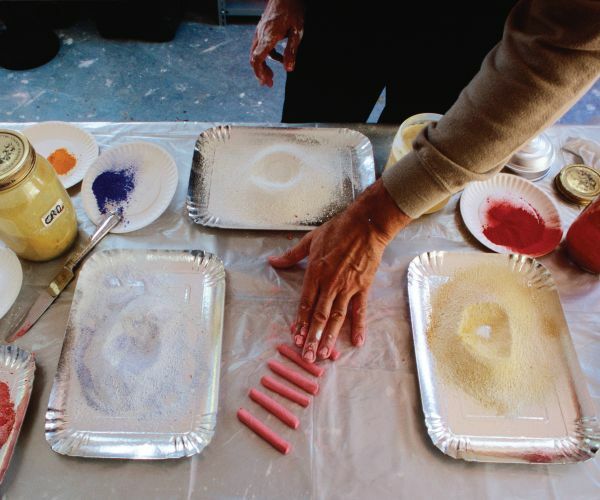 Other pigments are so fluffy that they produce crumbly and powdery pastels even with a very strong glue mixture. These pastels tend not to rub off and attach well to the drawing surface, but remain a dusty powder. An inert material or a pastel conditioner can sometimes be used for these pigments, or they can work in mixtures. Better yet, avoid these pigments altogether and use a more friendly one. Pastels do not require fancy and exotic pigments. It is more important that the final product is enjoyable to use. Carefully mixing the ingredients and forming the pastels will result in a much better product. Commercial pastels and paints are ground by a special machine that put the mixture through a series of steel rollers. Grinding does not refer to making the pigment finer; all pigments are sold with a consistently fine grain that is sufficient for pastels and most paints. The grinding process refers to the amalgamation of the liquid with the powder. This may seem easy, but on a microscopic level, the binders resist entering the pores of the pigment. The more the paste is worked, the better the pastel. Working carefully with the materials will also make the job go faster, limit the mess and create less waste. Latex surgical gloves, dust mask and goggles are standard recommendations for working with dry pigments. The area should be well ventilated, but not windy. 1. Sift together powdered colors to be mixed into a tint. 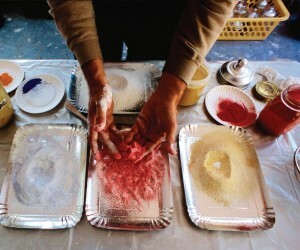 Make a small hill of the dry pigment on a plate. Ceramic plates will be washable, but many artists prefer plastic disposable plates. This is also likely to be better for the environment than washing the excess pigments down the drain. Use a spoon to create a volcano-like form with a crater in the center of the hill. Pour the desired mixture of emulsion and gum, (previously mixed together), into the crater. 2. Using the spoon, begin to gently stir the binder mix into the pigment. Do not try and mix everything together at once, but slowly incorporate more and more pigment into the liquid until it becomes a paste and then starts to become clay-like. Try to keep the dry powder dry and free from small bits of the liquid or paste. If the powder is free of hard lumps it will be easier to use again. 3. Eventually the paste will become claylike and it will not be possible to work with the spoon. At this point it can be worked with the hands. First use the tips of the fingers to press the soft mass repeatedly into the dry pigment. When it has become dry enough, it can be rolled and folded in the hands like clay without sticking to the gloves. 4. Knead and roll the claylike dough between the hands two or three dozen times quickly until it is flexible. This should take about five minutes. If the pigments are difficult, the dough can be worked on a marble slab by scraping a spatula over it. In this way it is possible to see if the dough is smooth or contains small lumps of dry pigment. Use the spatula to gather up the dough and knead it again. 5. The dough can then be rolled into a ¾” diameter log, which is then cut crossways into ¼” segments. Each segment is then picked up individually and worked into a pastel. 6. Pastels should be formed between three fingers to their appropriate shape and size. They should only be rolled back and forth for one or two passes to make them smooth and round. This can be done with a very small wooden board if desired. Rolling the pastels too much will make the binder leach out to the outside and this will forming a hard shell or crust when they dry. 7. Pastels should dry at room temperature, not in the sun. They are ready to use within three days, sometimes sooner depending on the color. Giving them a consistent size and shape is helpful for packing them. One very good substitute for gum tragacanth is methyl-cellulose glue (usually purchased in hardware stores as wallpaper paste.) With cellulose glue the instructions on the box should be followed for its preparation. It will almost never need to be used at more than half the recommended strength, and usually at an eighth. Common to all of pastel binders is a heavy mucous consistency with a very low binding power. Another common binder is wheat starch. Of the recommended binders, only wheat starch comes with a consistent recipe. It can be mixed in a 1:16 proportion, (starch to water). Other traditional artists’ glues such as rabbit skin, gelatin, egg yolk, and even white glue can and have been used, but are significantly inferior. For cost saving purposes and for street festivals, much cheaper pastel chalks can be made with precipitated white chalk, (as in commercial chalks), instead of titanium white. Even with pure pigment pastels, white pigment forms half of the total pigment used in a balanced palette. This is a tiny fraction of the cost of titanium white, but the colors will sink if fixed. Buying powdered iron oxides from construction suppliers will reduce costs significantly. These pigments are extremely reasonable and fine for even high-quality pastels. For brightly colored off-whites, liquid pigment such as Tints-all can be used instead of pigment. These liquid colors have a very high yield. They can also be mixed with the binders prior to forming the pastels. Liquid tints are much cheaper than watercolor, tempera, or acrylic colors, which already have too much binder in them for pastels and should be avoided. The tinting liquids used in the manufacture of house paint are also great for pastels. Pure titanium white and oxide colors can also be tinted with liquid pigment as a time saving method. The resulting pastels in this case are high-quality and quite lightfast. Simple oxide pigments and wallpaper paste will also yield decent pastels with a bit of testing and practice. 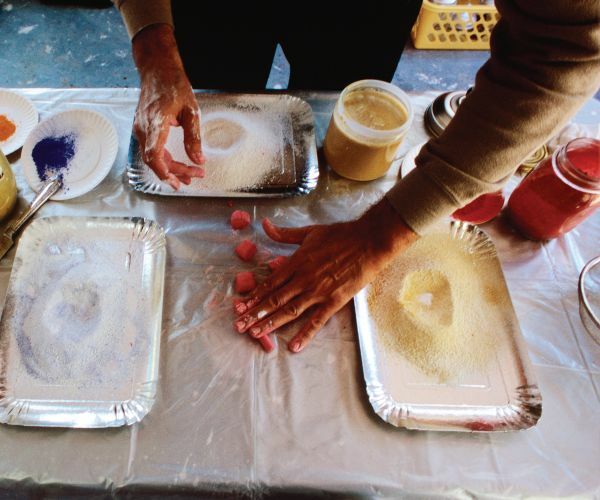 For children, white clay and natural food coloring can make chalks as well. Add some talc to the clay to soften it a bit. For the more adventurous, plaster of Paris has been used to make chalks. This mix can be fairly wet, so a mixing head on a power drill can be used. The resulting mix is then left to set in disposable plastic trays. Once the slabs are set, but not fully dried, they can be scored and broken into square sticks. A significant amount of experimentation is necessary to keep these chalks from getting too hard, but the process yields vast quantities of chalks in relatively little time- great for schools and small festivals. What all these recipes have in common is that the pastels or chalks cost pennies on the dollar and the production of the materials is an educational experience in itself. Artists learn to understand, respect and take responsibility for the materials they use. They become empowered with absolute control over their palette and their technique.